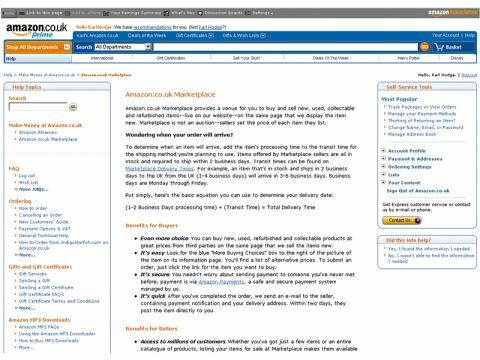 You may have noticed that Amazon lists additional purchase options alongside its main listings. These are links to items being sold on Amazon Marketplace. Overlook them at your wallet's peril. For buyers, Amazon Marketplace gives you the chance to buy new or used items from individuals and independent retailers. The prices are invariably better than the Amazon standard, and everything is kept in check by a feedback system that's similar to Ebay's – so you can tell who's naughty or nice. Keep an eye out for postage costs, though. Even if you're an Amazon Prime user, you'll have to stump up extra for delivery, bumping up the price and making some items less of a bargain. For sellers, it's currently a better and faster system for selling small, low-profit items like books and DVDs than Ebay. Amazon processes all your payments using its merchant credit card gateway, passing on the balance after it's taken a cut. It also gives you an allowance towards postage, which is why it's better for selling low-cost items than Ebay.